We are pleased to highlight one of our members, Nanna Mexico, who have a small chain of food retail outlets in Cambridge and Norwich. 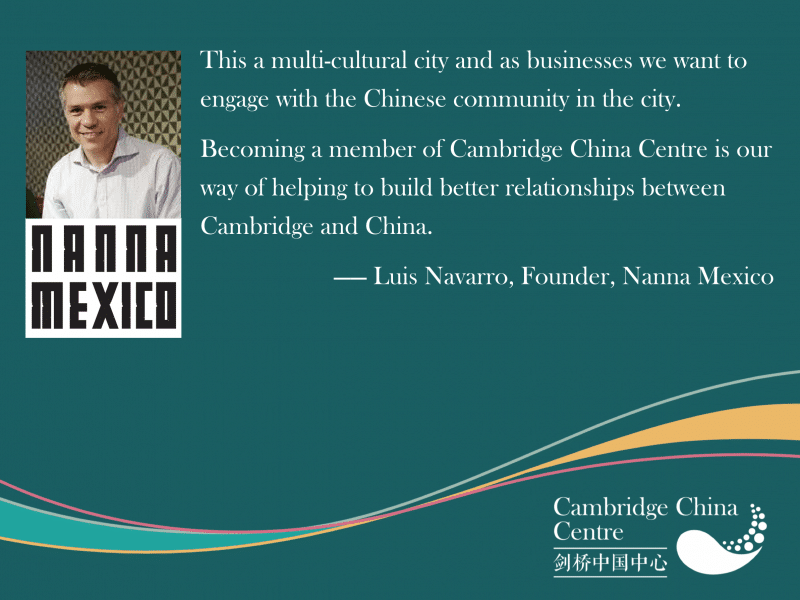 Luis Navarro, owner of Nanna Mexico, joined after our launch event in July 2018. We caught up with him to find out more about what Cambridge China Centre membership means to his business. ➤ Why did you join Cambridge China Centre? The main reason is because it is a very important relationship for a city like Cambridge and businesses in Cambridge. It is part of what will make the city thrive and develop better. The relationship between Cambridge and China has been long and historic but has been threatened lately. It is the kind of relationship that we need to strengthen and develop. Becoming a member is my way of ensuring that my business helps us to do that. ➤ Have you found benefit in meeting new people at Cambridge China Centre events like the Chinese New Year networking dinner? The dinner was good, interesting evening, very enjoyable, the place the setting, the dinner, getting to meet business people from China and their take on the way to do business was really interesting. One learns a lot from the different ways people do business. It was very, very good. The environment in which you make the relationships makes a big difference and makes them memorable. I would definitely recommend that others attend in the future. ➤ You decided to get involved in the inaugural Cambridge Chinese Culture Festival, as sponsor for the Film screening – can you tell me a bit about that? As a business, we are trying to do more with art and culture, it is a great way to introduce our business to people from different cultures. So, sponsoring the Cambridge Chinese Culture Festival made good sense, and was enjoyable as well. ➤ Through your membership with Cambridge China Centre, you’ve decided to start taking Alipay payments in your outlets, how have you found this? It was easy to integrate into the business. It is useful for the customers, and people are getting more used to knowing there are more places to pay using e-payments. We’ve definitely had a positive initial response, I see this becoming a big thing in the future. ➤ You seem very passionate about developing better relationships between cultures, is there anything else you’d like to add? This is a multi-cultural city and as businesses we have something to add to the conversation. We want to engage with a key community in the city and are keen to nurture this ongoing relationship. We look at this a as medium to long-term project which will form over time. This is a valuable and important relationship to nurture in our city. I think that the China Centre is a very timely addition to our community and is an opportunity for us all to strengthen our relationships. Nanna Mexico has three shops in Cambridge, as well as a food truck which can be seen around the city. For more information about becoming a member of Cambridge China Centre, click here.